Boris Johnson might be favourite to win the race to become London’s next Mayor but both he and rival Ken Livingstone have not been kind to the environment. By the end of their campaigns the pair will have spoken over 180,000 litres of hot air, producing more carbon dioxide than 330 hours of TV and enough gas to fill 60,000 party balloons, 560 blow-up airbeds or 1,400 space hoppers. 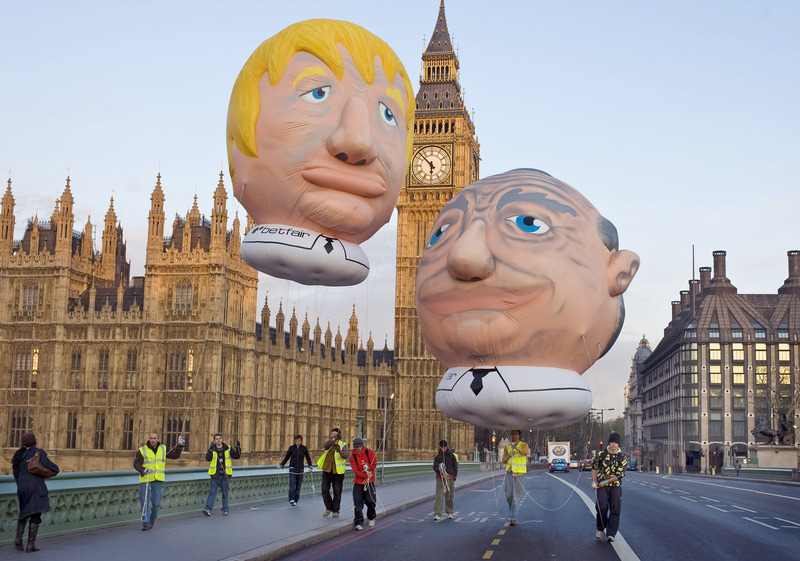 Betfair, the UK’s largest online betting company, carried out the research to mark the launch of the biggest ever election swing-o-meter – two 20-foot high inflatable heads of Boris Johnson and Ken Livingstone, which will be flown at different heights to show who’s ahead in the betting on the run up to polling day. At the rate Ken and Boris are talking, each head could already have been inflated over 25 times. By the end of his election campaign Ken Livingstone will have exhaled over 4,600 litres of carbon dioxide from his public speeches and media interviews – equivalent to driving an average family car over 44km. In comparison, Boris Johnson will have breathed out over 3,450 litres of carbon dioxide (25 per cent less than Ken) – the same output as an average family car driving over 33km. Betfair expects to see over £1 million matched on their Next London Mayor market as the race for City Hall reaches the final stages. Thousands of bets have already been placed and Betfair is bracing itself for a frenzy of last minute flutters over the last few days. With Ken’s official campaign lasting 45 days and Boris’s 32 days, and on the basis of them making an average of two animated 2 hour speeches per day, seven days a week, Dr Lewis has made the following calculations about their production of carbon dioxide (CO2) and hot air. KEN v BORIS: WHO’S TALKING THE MOST HOT AIR? If you want to clear the air around the London Mayor Election www.kenvboris.com cuts through all the political smog and tells you who is really out in front and why. Betfair developed the first successful betting exchange in June 2000 and now employs over 1200 people, spread across its bases in Hammersmith, Stevenage, Malta and Australia. Driven by cutting-edge technology, Betfair enables customers to choose their own odds and bet against each other, even after an event has started. Betfair processes 15 million transactions a day, more than all of the European stock exchanges combined. In addition to the exchange, Betfair now has an established games portfolio including Poker and Casino products. In 2007, Betfair launched a new company, Tradefair, for those wishing to bet on financial markets. Betfair is the holder of two Queen’s Awards for Enterprise, being recognised for Innovation in 2003 and most recently for International Trade in 2008. Betfair is a licensed betting operator in the UK, and also operates under licenses in Australia, Austria, Italy and Malta. This press release was distributed by ResponseSource Press Release Wire on behalf of Mischief PR in the following categories: Men's Interest, Entertainment & Arts, Women's Interest & Beauty, Sport, Media & Marketing, for more information visit https://pressreleasewire.responsesource.com/about.